preaching and spreading the word of God,presently pastors fly first class and some of them own some of the latest private jets that are worth millions of dollars. Most of these pastors own thousands of churches around the world which generate revenue,apart from that they are also savvy businessmen and women. 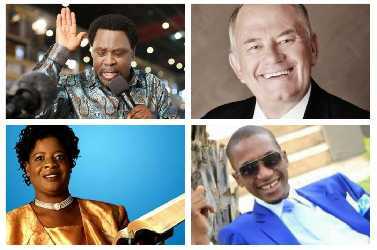 In this post we are going to quickly check out the top 10 richest pastors in Africa and their net worth. David Oyedepo is a Nigerian preacher and the founder of Living Faith Church Worldwide A.K.A Winners Chapel. He is currently rated as the richest pastor in Africa,he is estimated to be worth $150 Million Dollars. He is also the owner of some of the best universities in Nigeria namely: Landmark University,Covenant University and Crown University. Apart from being the richest pastor in Africa,he is also the richest pastor in the world,his church has the largest church auditorium in the world which is a 50,000 sitter auditorium which was recorded in the Guinness book of records. His other investments include secondary schools, bakeries, bottle water processing factories, petrol stations, residential apartments, shopping malls, restaurants Etc,he also has four private jets. US,he is the chairman of the Dominion House Publishing (DPH). E.A Adeboye is General Overseer of Redeemed Christian Church of God,he is currently estimated to have a net worth of about $130 million dollars. He joined the ministry in RCCG in 1973,where he worked as a translator,in 1981 he was appointed as the General Overseer of the church. He has been credited with taking the church to the height where it is today as the church has a presence in about 196 nations, including more than 14,000 in Nigeria alone,according to Adeboye,he said that his aim is to put a church within five minutes of every person on Earth. He is also a owner of 1 private jet. Chris Oyakhilome is currently estimated to be worth about 50 Million Dollars. Pastor Chris is the founder of Christ Embassy, a Christian ministry headquartered in Lagos Nigeria. His church is attended by up to 40,000 members. In 2016,he divorced his wife Anita Ebhodaghe. Uebert Angel is the founder of the Spirit Embassy Church in Zimbabwe. The pastor who is a british nationality has a net worth of about $50 Million Dollars. His church is a pentecostal church which was founded in 2007. He is ranked as one of the richest pastors in Africa. The charismatic television evangelist travels by helicopter to preach the message which is that God wants his members to be rich,as he is. He also has a private jet and other business investments. Pastor Tshifinwa Irene is a televangelist,her church is situated in Venda South Africa. She is the owner of Divine Truth World Restoration Services for World peace by Jesus Christ. She was a former banker at Standard Bank of South Africa between 1990 and 2001 before she left her banking job and started her own ministry. She got married in 1984 and never had a child until her husband passed away in 1992. Pastor Tshifhiwa Irene is ranked among the top 10 richest pastors in Africa. Pastor Ray Macaulay is one of the bankable pastors in Africa,he is the general overseer and founder of Rhema Bible Church in South Africa. According to reports Pastor McCauley lives a millionaire's lifestyle,Pastor Ray Macaulay is ranked as the 6th richest pastor in Africa. Pastor T.B. Joshua is one of the richest pastors in Africa,the controversial pastor is the founder of The Synagogue, Church of All Nations (SCOAN). Pastor T.B Joshua is also the most popular pastor in Africa,he has a very strong online presence across Africa with over 2 million fans on Facebook and over 450,000 YouTube subscribers,which makes him the most popular pastor on YouTube. He has a private jet also and is currently the 7th richest pastor in Africa. Matthew Ashimolowo is the founder of Kingsway International Christian Centre (KICC) based in London which is the largest Pentecostal church in the UK. The pastor converted to Christianity when he was 20 years.His program titled ''Winning Ways'' programme is aired daily in Nigeria,Ghana and Zimbabwe. He is also ranked as one of the richest pastors in Africa. Ayo Oritsejafor is the founder of Word of Life Bible Church, located in Warri, Nigeria. He was the former president of National President of the Pentecostal Fellowship of Nigeria and the Christian Association of Nigeria(CAN). He is ranked as one of the richest pastors in Africa,he also has other investments in banking, real estate, transportation and media. Lazarus Muoka is the founder of one of the largest and biggest churches in Nigeria which is the Lord's Chosen Charismatic Revival Movement. Lazarus Muoka was once a businessman before he gave up his business and started his own ministry.He is rated as one of the richest pastors in Africa.